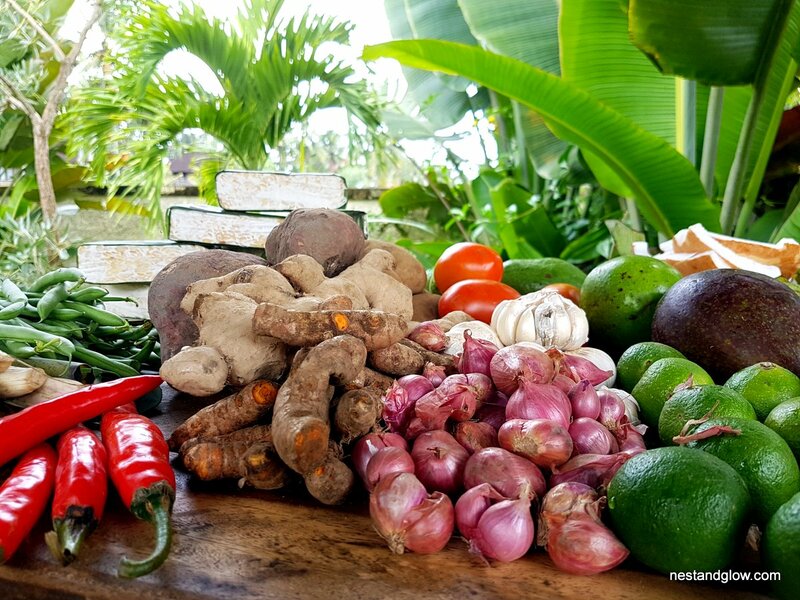 I’ve just got back from my local farmers market in Bali with heaps of fresh produce. All are locally grown and in season at the moment. What recipes would you like to see me make from these? Either comment below or on Facebook or YouTube. These were bought in Feb 2016. Most of the produce bought is nothing that you wouldn’t find in a UK shop. But I’ll do my best to explain everything that is more unusual. 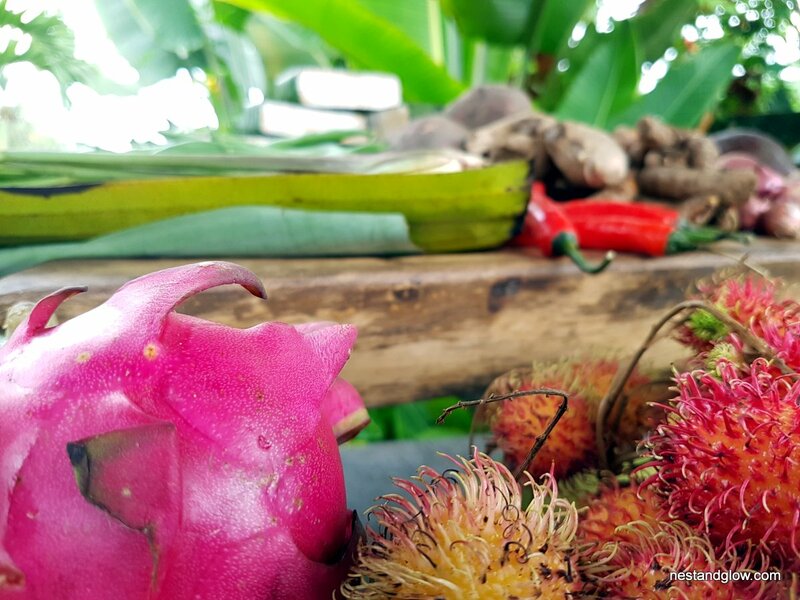 Rambutans; these are the red spiky fruits and are similar to lychees. Young coconuts these are the big green fruits. They are an immature coconut and need to be opened with a machete in order to obtain the coconut water and coconut jelly inside. Papayas; the local papayas are huge and have a greenish skin. Once opened they are just like any other papaya. Dragon fruits; these pink fruits are named this due to their skin. They contain a bright pink fruit that gives a great sweet flavour and rich colour. Tempeh; this is traditional Indonesian food made from cooked soybeans that are wrapped in a leaf that naturally contains spores to ferment the tempeh. It’s similar to tofu but as the whole beans are used it is higher in protein, fibre and has a stronger earthy/nutty flavour. Parts of tempeh may be furry with black spots but this is to be expected and it’s fine to eat. What recipes would you like me to make from these? I’m planning to make fresh raw coconut milk from the mature coconut. Hopefully in a traditional Balinese way as coconut milk is not that common out here as the locals prefer to make their own. With this coconut milk I’ll try to make a tempeh curry. Also, I’m planning to make a chia dragon fruit parfait desert. I’m very open to suggestions. I’ll post the video on all my social media (links to the side but all accounts are @nestandglow) and feel free to reply to these. Can you do some kind of oil free marrinated tempeh? All the recipes I see are deep fried and I dont do frying in oil as not healthy.